An artist's depiction of a suborbital spaceflight offered by Space Adventures aboard an Armadillo Aerospace Vehicle. Seattle's Space Needle is offering a free trip on the spaceship as part of its Space Race 2012 contest. If you've ever wanted to fly to space for free, here's your chance. Seattle's Space Needle and the private spaceflight company Space Adventures are teaming up to send one private citizen on a suborbital space tourist flight free of charge — a $110,000 value. The launch could take place sometime in 2012, though the date hasn't been set yet. 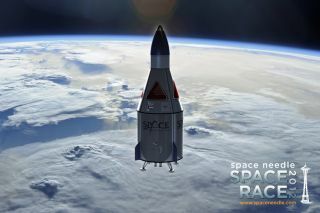 The sweepstakes, called Space Race 2012, officially opened Monday (Aug.1). Contestants must enter on the Space Needle's website by Nov. 30 to be considered. On Dec. 1, 1,000 entrants will be chosen to move on to the next phase, which is a competition involving video submissions. Judges will narrow this pool of 1,000 considerably, and voting by the general public will select a small group of finalists, Space Needle officials said. In 2012, those finalists will compete in a "series of challenges" to determine the grand-prize winner, according to Space Needle officials. The grand prize consists of a suborbital spaceflight, up to an altitude of about 62 miles (100 kilometers), aboard a vehicle provided by Armadillo Aerospace. Space Adventures is selling seats aboard an Armadillo spacecraft for $110,000, so that's the approximate value of the prize. Another lucky entrant will win a seat aboard the plane G-Force One, which provides passengers with a zero-gravity experience. That prize is worth about $5,000. Armadillo's vehicle isn't quite ready to carry people to space yet, which explains why the launch date isn't set. Armadillo and Space Adventures aren't the only players in the suborbital spaceflight arena. Indeed, a private space race seems to be developing, with multiple firms gearing up to carry tourists and scientists to suborbital space. Virgin Galactic, for example, is charging $200,000 per seat aboard its SpaceShipTwo vehicle and should be making manned flights by next year, company officials have said. XCOR Aerospace says its two-seat Lynx craft should be making test flights by next fall. Seats aboard that rocket ship will run $95,000. And the secretive company Blue Origin, founded by Amazon.com CEO Jeff Bezos, is developing its own vehicle, which is called New Shepard. The Space Needle is sponsoring the competition to celebrate its 50th anniversary, which comes next year. Space Adventures is the only firm to have sent private citizens to space. The company has sent seven people on eight flights to the International Space Station, using Russian Soyuz spaceships. Those orbital tourists trips are much pricier than suborbital jaunts; ticket prices for the eight flights are thought to have ranged from $20 million to $35 million.